One day while speaking to a friend of mine, she mentioned that she had been looking for a child’s themed doorstop for her son’s room, but hadn’t managed to find one anywhere that would be suitable. So I said I would have a look and see if I could find any. 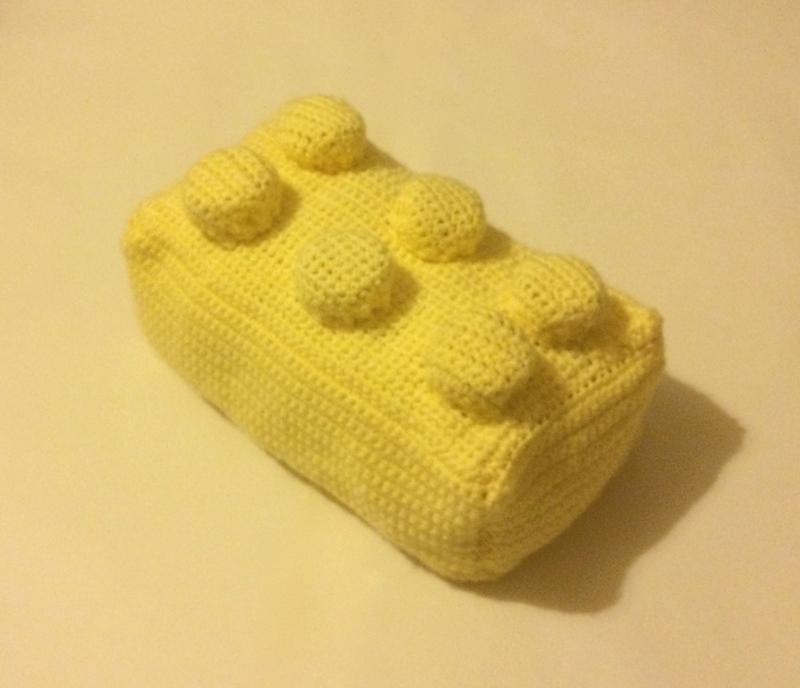 Her little boy is absolutely obsessed with anything and everything to do with Lego, so I had the thought… what about a Lego brick doorstop! When I first made these, I tapered on rows 3,4 and 5 (increasing by 1 stitch each time) and on rows 14, 15, and 16 (decreasing by 1 each time) so the shape was more oval-like, but while actually putting it together, I don’t think it helped much with the gathering. Another option I thought of after finishing would be to work in rounds to get the size of top you need, increasing the size by the necessary amount stitches each round. Once the correct top size is reached you would then stop adding additional stitches and continue the rounds until the correct depth of the stud is reached. To attach the brick pieces together I placed two pieces right side together and used a row of dc stitches down the seam. 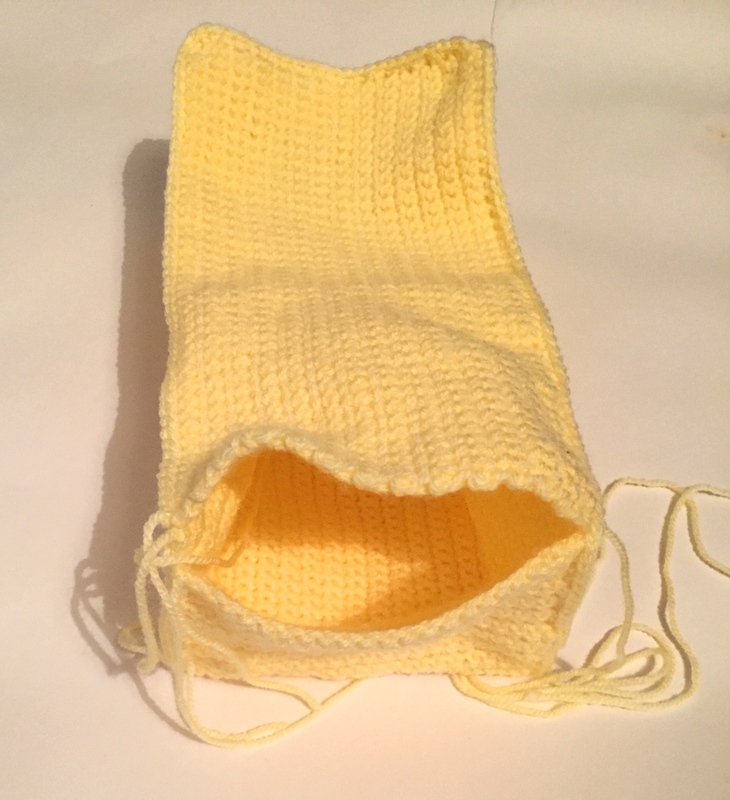 I repeated this until all the pieces had been joined together, except for one seam, which I left open for stuffing and inserting the bag of sand. As I had attached each piece to the brick with the right side together, it meant that the brick was inside out. I therefore turned the brick the correct way by pulling it out through the open seam. For the studs, I cut out round pieces of cardboard (4cm / 1 ½”) to act as the shape for the top and bottom of each stud (6 studs so 12 pieces in total). 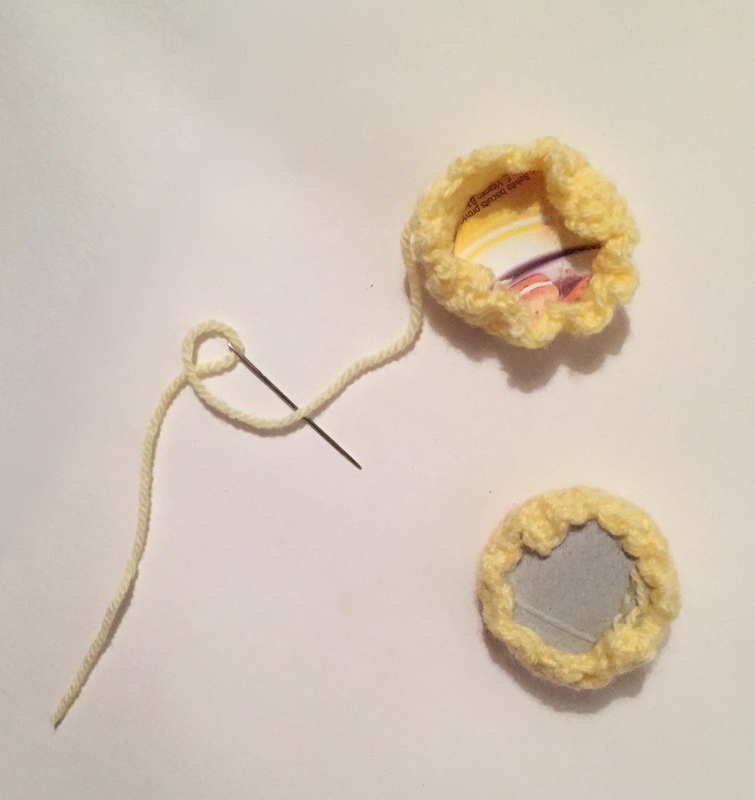 Next, I placed a cardboard round in the middle of one of the stud sections and using the long length of wool still attached, I wove it around the edge of the crochet piece. Wadding was then placed in the stud on top of the cardboard round with another cardboard round placed on top to enclose the wadding. 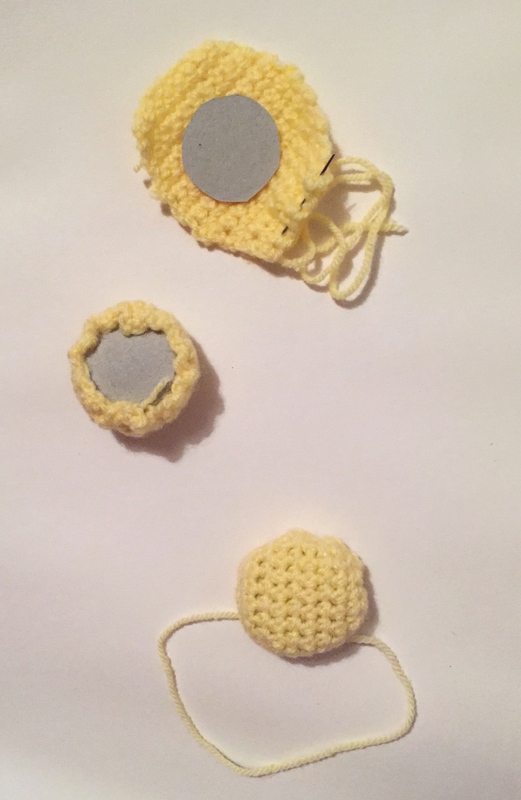 The length of wool that had been woven round the stud previously was then pulled tight to gather together the crocheted stud around the cardboard round inners. This was then fastened off to complete the stud. Repeat another 5 times. Once the brick was completed I then needed to stuff and weight the brick. It would have been possible to use a wadding wrapped actual brick for the inner part but as this was for a small child’s room I thought it might be more suitable filled with wadding and play sand (double plastic bagged to prevent any leaks!) You could also use gravel, dried lentils and pulses, or rice – anything that provides enough weight really. The studs were then sewn to the top of the brick. I was really pleased with how it turned out and the little boy was absolutely over the moon too – he now wants more in different colours! Thanks for the cute idea. 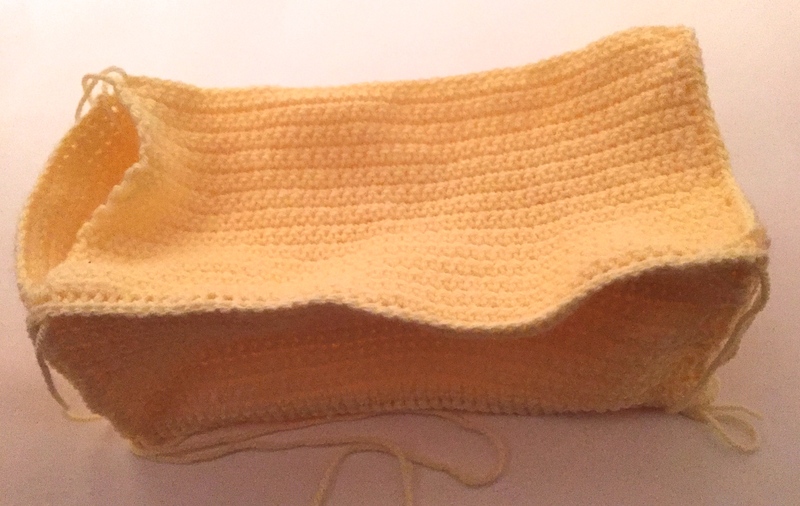 Hubby wants a door stop crocheted (had an old one that we had to toss)….so this is cute and easy. I hope to remember to send you a note after this is made. He loved the studs you added. Thank you, would be great to see it when it’s finished. I’m hoping to get a few of these made soon, so there will hopefully be a few more appearing on my blog!